By Saturday all of us or going to be well sick of all this Valentine’s day nonsense. The flowers, the love, the pure and utter sh*te of it all (my comments have nothing to do with the fact that I’m recently single…). 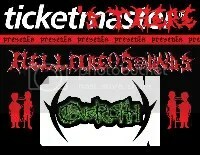 Anyways, to celebrate that day ending, CARNAGE have a pretty tasty line-up in Fibbers on Saturday the 15th. 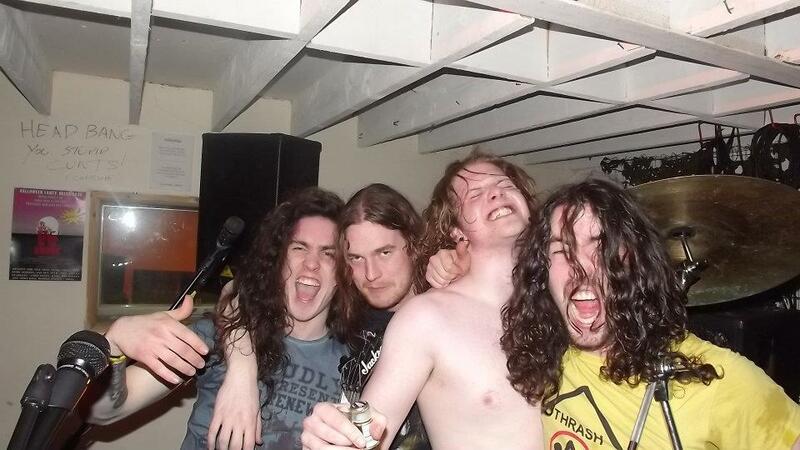 For Ruin, Overoth & Rex Shachath are all playing upstairs in Fibbers under the carnage banner. It’s just €5 on the door which is a pretty amazing price for these three bands and don’t go forgetting the many drink promos that always come with Carnage. See you there! Tickets There was a bit late to outline the full Molten Battle of the Bands this year, but we’re not too late to get you in on the action for… Heat 7 (yeah, it’s silly big and complicated). Anyway €5 will get you a handy chance to catch Psykosis, Killface, Rex Shachath and Aggro-Culture battle it out for a chance to progress to the final round with an overall goal of playing this year’s Bloodstock where they’ll rub shoulders with the likes of Megadeth, Emperor, Amon Amarth and many more. For those not to au fait with the local scene then this is your cheap chance to get down to Fibber MaGee’s and support your own. Believe me, it’s not a chore. Some of these guys can share a stage with the best of them and the others are getting there. 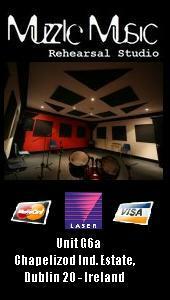 So break with a fiver, come to Fibbers and enjoy. MONSTERS OF ROT III FESTIVAL – NEXT MONTH! Tickets There have been too slow for this one, but it’s not too late. Next month will see the third instalment of the annual MONSTERS OF ROT festival in Co. The bill so far includes eleven ear crushing bands including Dichotomy, Gargantuan, Rex Shachath (some lads from Overoth), On Pain of Death, Grinned and more. 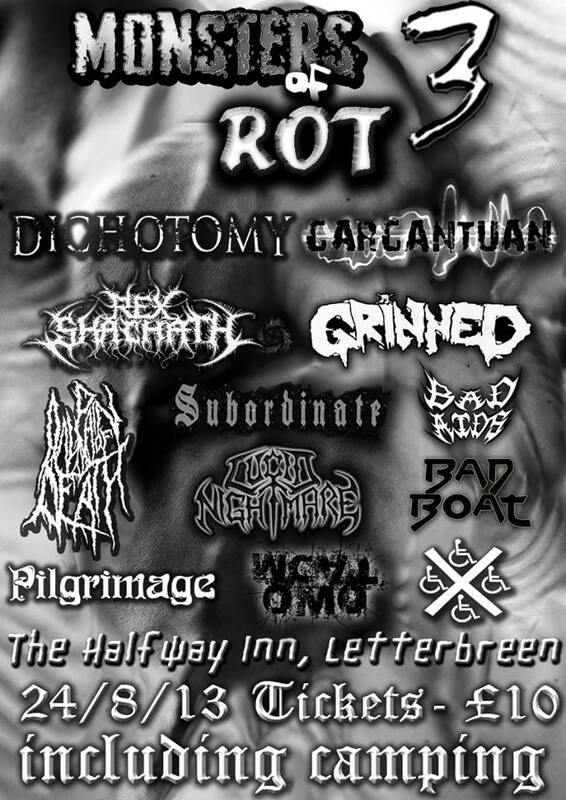 It takes place on Saturday, August 24th at The Halfway Inn in Letterbreen and will only set you back £10. Adding to this, the festival will also include camping facilities, fully stocked bar, toilets and a Meat and Vegan friendly BBQ (Vegans please make sure you read the next story – you do not belong in metal – and stop reading Tickets There). On top of that, the organizers have arranged a free taxi service from Enniskillen to the venue so what more could you honestly ask for? 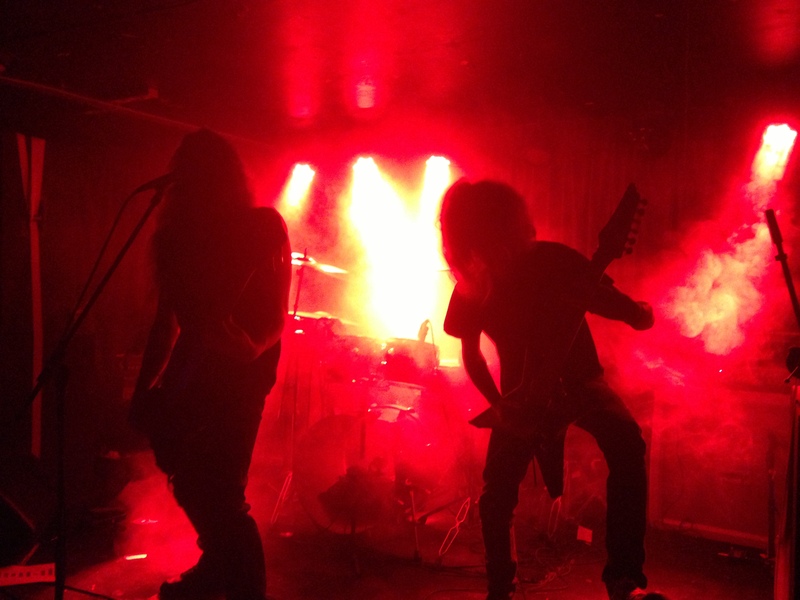 Six bands will play the Pint on May 18th as part of Into The Void Records’ Day of Death II. 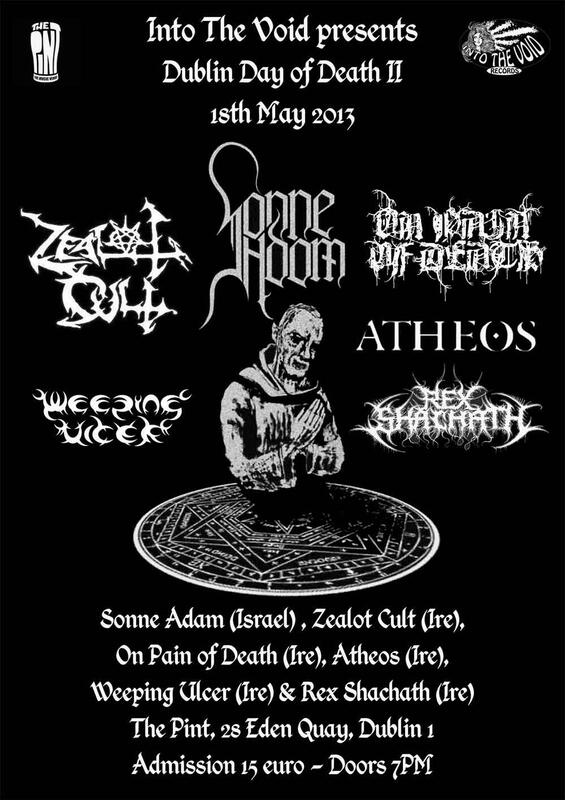 Coming all the way from Israel of headliners, Sonne Adam and they’ll be joined by Irish grown acts Zealot Cult, On pain of Death, Ahteos, Weeping Ulcer and Rex Shachath. 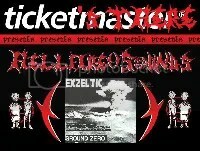 Admission if €15 and doors are at 7pm. For more details check out the Event Page on facebook. 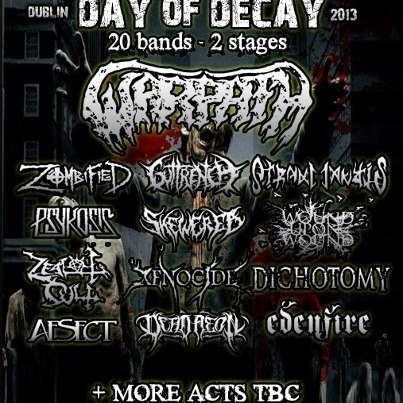 Gutfuck Promotions (Wayyyyy better name than ‘MCD’ IMHOyc) have announced the 2013 Dublin Day of Decay. 22 bands, 2 stages in 1 day. If you’re a fan of any sort of extreme metal then this is another excellent opportunity to check out some of Ireland and Europe’s best up and comers. Everything from (wait for this) Thrash metal, death thrash, death metal, brutal death metal, old school death metal, goregrind, depressive blackened death, tech-death and melodic tech-death is catered for at this almost all day event. 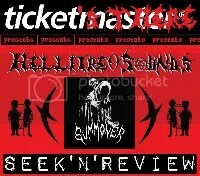 It takes place June 1st @ Fibber MaGee’s. 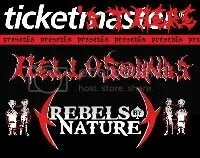 Doors open at 3pm and its €14 entry. Oh, who’s playing? Well, WARPATH, Zombified, Guttrench, Overoth, VxPxOxAxAxWxAxMxC, Atrax Mantis, Scordatura, Psykosis, Cemtex, Rex Shachath, Skewered, Wound Upon Wound, Zealot Cult, Atheos, Xenocide, Killface, Dichotomy, Grinned, Aesect, Edenfire, Dead Aeon and Gargantuan will all be there. Drinks promos, spot prizes ..etc all on the day as well.